Honda has surprised journalists and enthusiasts alike at the ongoing Frankfurt auto show, with a simply electrifying design. Of particular note is that, even in the instant-gratification age of social media, the Japanese company was able to keep its newest vision of a modern electric car under wraps right up to the reveal. Strictly speaking, the Urban EV is a concept. Honda R&D Executive Ikuo Takeishi maintains that a production version is still under development. 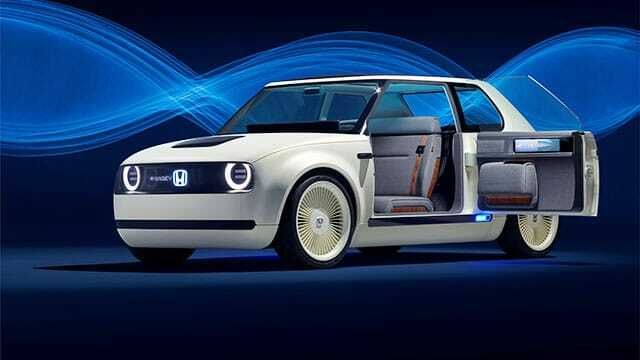 Many recent Honda concepts never quite made it to the dealership floor, including the EV-N concept of 2009, a similarly "retro" vision of an electric Honda. Several European cities, perhaps optimistically, have announced bans on gasoline- and diesel-engined cars by 2030. So it is now reasonable to expect that Honda's electric city car will debut in Europe within the next two years, and that it will visually recall its humble beginnings. The Urban EV reaches back forty-five years, to the rambunctious Civic of 1972. That is the car perhaps most responsible for Honda's image as an engineering-driven company. As the auto industry contemplates the complexity brought on by a brave new future, including legal challenges to autonomous vehicles and electric vehicles which are roughly half as profitable as their internal-combustion equivalents, the Urban EV is most clever in that it represents new technology made friendly by a familiar package. The power of nostalgia is not to be underestimated in these challenging times. As 1970 dawned, almost fifty years ago, Honda was the world's largest motorcycle manufacturer, with a cursory line of dinky "N600" cars. They had just six hundred cubic centimeters of displacement, two cylinders, thirty-six horsepower, and no radiator. The company's founder did not believe in the added weight and complexity of water cooling. On a good day, and a level road, they could hit seventy-two miles per hour. Flip the heater into the "open" position, and the engine's clatter came into the cabin with the warm air. The first ads compared the Honda with a big red apple. Subaru's smaller 360 minicar aside, there wasn't much else to compare it to. People used to stand on street corners and point at these cars, which were effectively four-wheeled motorcycles. "You don't take yourself too seriously, do you?" asked Road & Track. "Sure, everybody has a basic self-regard, nothing wrong with that. "But if you have an image to maintain, or think you do, in short if you are the sort of person who objects to being laughed at, better you read about the Honda for entertainment and information only. "Because what happens mostly to people riding around in Hondas is, they get laughed at. Some of the laughs are warmly sympathetic and friendly, a few are finger-pointing, knee-slapping, malicious barks, but everybody laughs." The N600 was not long for this world. Honda had benefited from a U.S. emissions exemption for sub-800-cc cars. That allowance disappeared after 1972. New regulations left the 600 slated to lose horsepower and gain weight and cost. Fuel economy would suffer. With a new, water-cooled engine, double the size, the '73 Civic was Honda's first real car for America. It permanently shifted Honda's image from bikes to cars just as OPEC turned off the taps and gas prices skyrocketed. No one was laughing anymore. The Civic was little short of a revolution on wheels. It offered thirty miles per gallon and a fair degree of comfort for even the tallest drivers. Independent suspension front and rear, front disc brakes, and rack-and-pinion steering made it responsive. Aptly enough, it stickered at $1,973, but that quickly grew with demand - particularly when the EPA proclaimed it the gas mileage champion of all cars sold in the U.S.
You could hardly ask for a more efficiently packaged car than the Civic. Within its diminutive twelve feet of length and five-foot width, there was space for four adults and seven cubic feet of luggage; or, with the rear seat folded, an extra nine cubic feet of luggage with space for two people. Civic proved so right for its time and application that it's a wonder that all cars which followed weren't carved in its image. It started a front-wheel-drive movement, particularly among rat racers, who loved its raw-boned aggressiveness. Its water-cooled, overhead cam, four-cylinder 1,237cc engine punched out fifty horsepower at 5,500 rpm - just fine in a car that undercut the lightest American car by more than seven hundred pounds. With a solid feel, good fit and finish, and the sound of a rotary sewing machine, the Civic's legend was well in the making. Then, in 1975, the Civic gained considerable acclaim in engineering circles. It became among a very few models to meet stringent emissions standards without a strangulating catalytic converter. The "stratified charge" CVCC engine was as much a revelation as the Civic itself had been two years earlier. "If it were the standard car in America, most of our automotive problems would disappear," Road & Track gushed. When the Civic's basic goodness was stretched into the 1978 Accord hatchback, few cars ever met with such praise. The mildly sporting 1978 Prelude, under the skin an Accord, proved the flexibility and inherent value of Honda’s engineering. The Civic was much better than it had to be. True, the basic ingredients responsible for the pleasant, often engaging way in which the Civic, Accord, and Prelude went down the road were used by other manufacturers. Front-wheel drive. Transverse-mounted engines. MacPherson independent front and rear suspensions. Yet Honda packaged and tuned these elements better than most. The Civic went on to automotive fame, armed with ever gutsier yet smooth four-cylinder engines, simple, high-quality, and thoughtfully executed interiors, increasing doses of sophistication and refinement, and yet affordability. Now in its tenth generation, Civic is Honda's longest-running automotive nameplate and its largest-selling model, globally. Last year, Honda sold nearly 367,000 Civics in the United States, making it the second best-selling car in the country (after Toyota's larger Camry). Four inches shorter than the Jazz (the smallest car Honda sells in Europe) but almost fourteen inches longer than the original Civic or today's Volkswagen Up, the Urban EV showing at the German show in Frankfurt is an electric vehicle for the city. It features a high-density, lightweight lithium-ion battery pack, integrated heat management, and an evolution of "V2G" energy transfer functions both to and from the vehicle. Electricity will be stored and shared between your car, your home, and the grid, under Honda's new "Power Manager" technology, currently undergoing testing in France. According to Philip Ross, senior vice president at Honda Motor Europe, the Honda Power Management Concept can use the EV's battery to power a home and cut down electricity use coming from the main grid. It can also send unused energy back and "sell" it to allow the EV owner to gain income. Tesla has claimed that this kind of system prematurely degrades electric-car batteries. But a recent experiment conducted by European utility company Enel found that battery life can actually be extended when stored electricity is sold back to the grid. Honda has not released much information, but a 200-mile range between charges seems possible. Expect the blue backlit Honda badge to find its way to all future electric vehicles from the company. Blue is the new green. Like the Smart Vision EQ ForTwo concept, the headlight panel features a multilingual message area that can communicate greetings or charging status information. There's a similar panel out back, too. A battery charge indicator is located near the rear wheels, while the charging cable is housed atop the hood. The rear-hinged "suicide" doors reveal a light, airy interior with slim A pillars for good visibility. There's seating for four on dual bench seats. The traditional instrument panel has been replaced with a panoramic touchscreen display, with additional displays flanking the driver in place of wing mirrors. A "quartic" steering wheel recalls British Leyland's Austin Allegro, unfamiliar to Americans but a common car in Britain at the launch of the original Civic. The wheel was controversial at the time, but wheels that aren't quite round are now a regular supercar feature. The wood-finished "floating" dashboard console recalls the full-length woodgrain of the original Civic. There's also a "Honda Automated Network Assistant" which, according to Honda, "learns from the driver by detecting emotions behind their judgments." Acting as a personal concierge which makes new choices and recommendations, it's further evidence that mobility and daily life will be seamlessly linked. The Urban EV Concept previews a production model that will go on sale in Europe in 2019. It will be based on a new platform developed to be part of Honda's "Electric Vision" strategy to expand their EV offerings. There's no doubt that the little Honda's retro styling will help it stand apart from less characterful designs like the Hyundai Ioniq and Kia Niro, and from hyper futuristic, one-box urban pods such as the BMW i3, Chevy Bolt and Volt, Mitsubishi i-MiEV, and Nissan Leaf - and even Honda's own Clarity line. You might say that the Urban EV presents an alternate view of a modern Civic; what that car might look like, had it taken a consistently evolutionary design approach in the vein of the Porsche 911. Certainly, it is a reminder that Japanese cars, once an eccentric curiosity outside a crowd of enthusiastic early adopters in California, have now been with us long enough to have a rich heritage from which to draw. However, with its flared arches and low stance, Honda's proposal borrows liberally from the original Mini Cooper too, and some see echoes of the original Volkswagen Golf and Polo, Ford Fiesta, and Lancia Delta; Fiat's 127, Peugeot's 205, and today's Fiat 500. At the Frankfurt show, Honda confirmed that electrified technology will feature in each model it sells in Europe by 2025. By 2030, Honda plans that two-thirds of its sales will consist of "electrified" vehicles, which will encompass not only pure electric vehicles, but hybrids, plug-in hybrids, and fuel cell vehicles. When the Urban EV enters production sometime in 2019, it will not be coming to America. Sales of subcompacts here are down twenty-three percent. Though sixteen different pure EVs are available in America, in the first eight months of 2017 they amounted to just 0.5 percent of the market. That said, there's every chance that this car will have an impact on Hondas sold here - albeit certainly not for its retro styling, and probably not only because of its new-age technology. Sometimes, when moving forward, it's worth looking over your shoulder. Honda has come under much criticism over the past decade for the heaviness, both literal and visual, of its cars. It all too rarely challenges convention in meaningful ways, and indeed was late to the electric-vehicle party. "There's no doubt we lost our mojo - our way as an engineering company that made Honda, Honda," chief executive Takahiro Hachigo told Reuters recently. Some have surmised that Honda became trapped by Japan's "monozukuri" approach to manufacturing. This culture of incremental improvement and production line efficiency served the company well in the decades after World War II. However, today's challenges - in particular, electrification, connectivity, and self-driving cars - demand a more nimble, more flexible approach. Hachigo, Reuters went on to recall, joined Honda as an engineer in 1982 and became CEO in June 2015. "Now he wants to revive a culture that encouraged engineers to take risks and return to a corporate structure that protected innovators from bureaucrats focused on cost-cutting. "To help him achieve this, he says he has tapped into the ideas of a small group of Honda engineers, managers and planners. This group is modeled on the freewheeling "skunkworks" teams that drove aircraft development at Lockheed Martin, computer design at Apple and self-drive technology at Google." Perhaps the Urban EV, imbued with the freewheeling spirit that made Honda famous, can reinvigorate the company in the same way that the 2008 Fiat 500 ignited an Italian automaker that at the turn of the Millennium was near bankruptcy. Don't expect Honda to fall into the same, tunnel-vision trap as Fiat, however. While Fiat has transplanted the 500 "face" on everything it makes, the Urban EV appears to be a one off.